London, 1 October 2015 - The Coalition for Affordable T-DM1, a group of cancer patients, doctors, and access to medicines advocates, sent a letter today to Secretary of State for Health Jeremy Hunt asking that the U.K. Government authorise the manufacture or importation of generic versions of the expensive breast cancer treatment T-DM1, also known as trastuzumab emtansine or by its trade name Kadcyla. On 8 August 2014, the National Institute for Health and Care Excellence (NICE) decided that T-DM1 should not be made available on the National Health Service (NHS), citing its extraordinarily high cost. NHS patients in England continued to get access to T-DM1 through the Cancer Drug Fund (CDF), but, following a review sparked by huge budget overruns on expensive medication, it was decided on 3 September 2015 to de-list T-DM1 from the Cancer Drug Fund. After 4 November 2015, no new patients will be able to access T-DM1 on the NHS. NICE estimates that 1,500 women in the UK could benefit from treatment with T-DM1 every year. Concerned that the high price of T-DM1 presents an undue access to barrier for patients with an aggressive form of breast cancer, the Coalition for Affordable T-DM1 formally asked the Government to employ its authority under the Crown Use provisions in the U.K. Patents Act 1977 to allow for the use of T-DM1 patents to import or manufacture generic versions of T-DM1 without the permission of Roche, subject to affordable compensation. T-DM1 is used to treat late-stage breast cancer patients who test positive for human epidermal growth factor receptor 2 (HER2), a protein that causes an aggressive form of breast cancer. Roche owns the patents on T-DM1, and charges extraordinarily high prices. A year of treatment for the average patient costs £102,405, roughly 3.9 times the 2014 UK per capita income of £26,350. The following are quotes from several of the persons signing the letter to Secretary of Health Jeremy Hunt. To arrange interviews please contact Zack Struver using the details at the top of this release. "The time has come to challenge pharmaceutical manufacturers charging ever higher prices for important medicines because they can. Roche's Kadcyla (Trastuzumab emtansine or T-DM1) could benefit 1,500 women with breast cancer in the UK annually, but the cost - £5,908 per 3 week cycle, or £102,405 per patient per year - is unaffordable by the NHS or by ordinary patients. 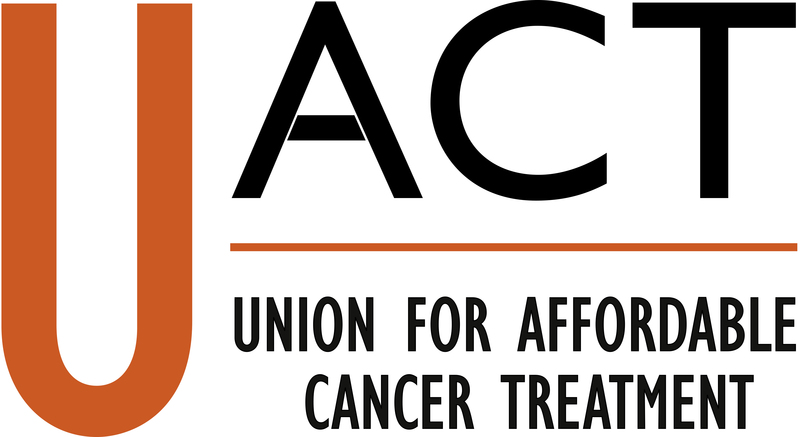 UACT urges the government to use its legal entitlement to issue a compulsory licence for Kadcyla, which would open the door for the manufacture of biosimilar versions and. thus reduce the price through competition." "I am a stage 4 breast cancer patient who is alive today and leading an active life because I have access to T-DM1. The Roche price for T-DM1 is excessive, and a barrier for patients. By being proactive, and standing up for patients, the UK government has the power to change this. It can make the drug more affordable, and more available to patients facing a painful and unnecessarily early death. If the UK government begins a serious review of this petition, it instantly improves its short term bargaining position with Roche, and it begins to map out a future where cancer patients have a better chances to get the drugs they need." "Women with breast cancer will be devastated to discover that Kadcyla, which could extend their lives by months, is not available in England because of the inordinate price demanded by the manufacturer. When they are approaching the end of their life, they will reasonably expect that all options for their treatment have been exhausted. This includes options for procuring the best medicines available. Nobody should accept that we are out of options for getting Kadcyla until Crown Use has been considered and attempted by the Department of Health. Our proposals are feasible, are written by experts, and the alternative is doing nothing. As a medical student, I hope that the Department of Health does not ignore these legal provisions that can be used to guarantee access to medicines in the UK. Those of us who have seen cancer in our work and in our families will not be satisfied with simply giving up when a manufacturer drives an excessively hard bargain." "The UK government can take simple steps to get women with breast cancer an affordable version of the life saver TDM-1, priced out of reach by Roche. It is the obvious thing to do, so we urge the government to move fast." "Drug prices will not go down unless governments take action to bring them down. It is very likely that women will die before they have to as a result of Roche's pricing policy on Kadcyla. The UK should be pursuing every credible opportunity to secure a fair price for this breast cancer treatment - including this proposal to produce a generic version of the treatment - as well as exploring the broader reforms to pharmaceutical R&D policy that would tackle the root cause of these high prices." "This proposal achieves something subtle but significant: it creates a choice. The status quo is no longer simply the default, it becomes an explicit decision which must be justified. It becomes a decision with which the British public can hold the government to account. There are 1,500 UK citizens living with breast cancer right now who could be kept alive by this medication. The solutions are all there in the document. The only question that remains is whether our government is more interested in protecting its citizens or the shareholders of a multinational drug company. Our drug system has not been there forever, and it was not chosen because it is the most effective way to make medications. It was chosen because it was the best way for drug companies to make money. An unfortunate side-effect of this system, is that millions of people have died from lack of access to medicines. People everywhere are suffering, simply because of their financial capacity. Is that right? At moments like this, we have the chance to change things, to improve them. It's simply a question of public and political will. We have to ask ourselves 'what sort of world do we want to live in?" "The campaign seeks to secure a life-saving treatment for breast cancer sufferers whilst protecting the limited resources of the NHS. It also goes further than that: the [Coalition's] recommendations would give the government a proper strategy for making these sorts of drugs available to patients in a financially sustainable way." "The World Health Organization added 16 modern cancer treatments to the Essential Medicines List in 2015 and called upon governments and pharmaceutical manufacturers alike to ensure treatments are affordable to patients the world over, from the UK to Uruguay. We look forward to the UK's use of crown use provisions to overcome obstacles to treatment and stand with patients -- now, not decades from now. T-DM1 is a life-saving medicine and should be affordable now, not decades from now. Tackling cancer is a social justice issue and deserves to be treated as such."